The International Baccalaureate (IB) Middle Years Programme (MYP) is a purpose-built five-year programme for students aged 11-16. The programme is designed to meet the needs of IB World Schools, and to build upon the skills and knowledge acquired by students in the IB Primary Years Programme (PYP). 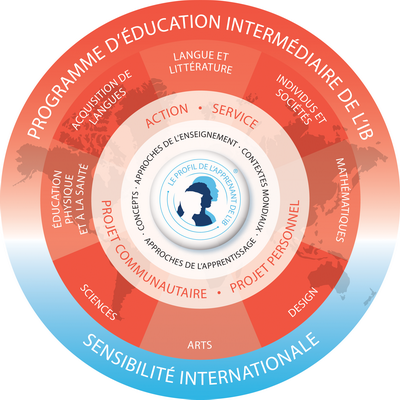 The IB MYP aims to connect classroom pedagogical practices and learning to the real world through the Global Contexts and the Learning Profile notions. The IB MYP is a holistic, student-centered programme that exposes students to diverse skills, content knowledge and experiences. The programme fosters the students’ intercultural awareness, communication skills and global understanding, thus equipping them with virtues essential for success as 21st century life long learners. The IB MYP educators strive to meet the needs of their diverse student body, who are often faced with a vast array of choices and challenges in today’s world. MYP is followed by the IB Diploma Programme (DP) which is an internationally recognized pogramme that prepares the students with the most optimal qualifications essential for university entrance worldwide. The IB Learner Profile was devised to develop students’ skills and to help them succeed in becoming accountable members of their respective communities. They represent ten attributes that are highly valued by IB World Schools, and that are essential in raising healthy, knowledgeable and insightful individuals. By the time the students graduate from the IB programme, they should be inquirers, effective communicators, open-minded, knowledgeable, thinkers, principled, risk-takers, balanced and reflective beings. The MYP Programme is a concept-driven curriculum which acts as a channel through which students learn to inquire into personal, local and global issues of significance, thus providing them with opportunities to delve deep into the core essence of the subjects they study. The IB MYP Programme consists of eight subject groups, with the content revolving around particular themes called Global Contexts. Those contexts are devised to aid students into making relevant connections between what they learn in the classroom and the outside real world. The Global Contexts perspective paves the way to creating a learning environment that supports multilingualism, global and intercultural awareness as well as independent internationally minded, responsible and well rounded individuals. Furthermore, in their final year in the IB MYP Programme, the school assesses students’ understanding of the Global Contexts and content knowledge, through a major independent personal project that is completed by each student individually.